The DS5 facelift has made its online debut ahead of its first public appearance scheduled for early next month at the 2015 Geneva Motor Show where it will bring a new Ink Blue paint. 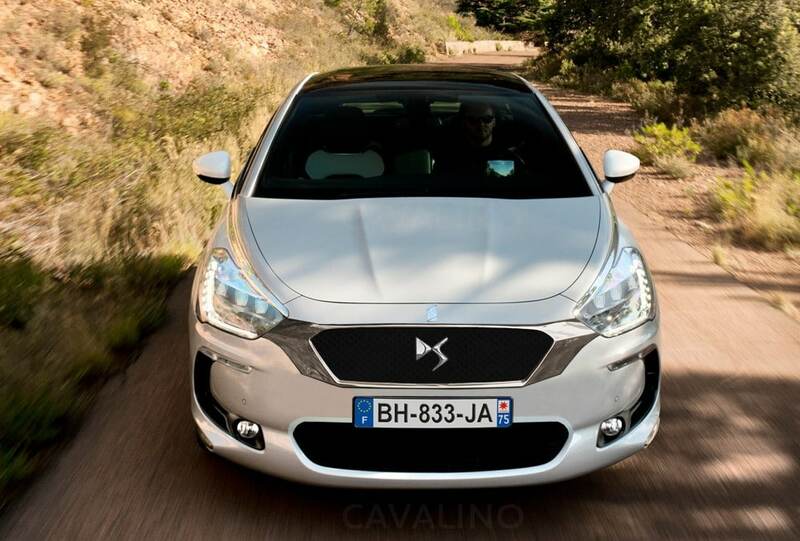 The refreshed French premium hatchback has received a fresh face featuring a more sculpted grille with the DS monogram in the center and flanked by xenon LED headlights with sequential turn indicators sourced from the facelifted DS3/DS3 Cabrio. The side profile shows a slender chrome sabre joining the tip of the headlights with the front window. At the back of the car there are mildly revised taillights and dual chrome exhaust tips incorporated in the bumper. Stepping inside the cabin, there's a new color touchdrive interface which has eliminated 12 physical buttons to enable a less cluttered layout. The system benefits from Mirror Screen technology which means that smartphone content can be "copied" on the touchscreen display. Other goodies offered include massaging front seats with memory function, heated side mirrors, keyless entry & start, ambient lighting, electrochrome interior mirror, Denon audio system and dual-zone AC system. The DS5 facelift has also gained a blind spot monitoring system offered alongside an array of safety systems like lane departure warning, automatic high beam function for the headlights, intelligent traction control, head-up display, reversing camera, hill-start assist, adaptive headlights and stability control, just to name a few. In terms of engines, the facelifted DS5 will be available with the latest PSA motors, including a THP 165 with 165 HP (121 kW) and 240 Nm (177 lb-ft) of torque sent to the wheels through an updated six-speed automatic transmission. Also available is a BlueHDi 120 delivering 120 HP (88 kW) and 300 Nm (221 lb-ft) through a standard six-speed manual or the aforementioned six-speed auto (optional). A beefier BlueHDi 180 with 180 HP (133 kW) & 400 Nm (295 lb-ft) is also available with the six-speed auto while the hybrid all-wheel drive diesel model has been carried over with a 163 HP 2.0-liter turbodiesel working with a 37 HP electric motor. The DS5 facelift will be unveiled to the public on March 3 during the first press day of the Geneva Motor Show where it will be displayed without Citroën's double chevron logo since DS is now a standalone brand within the PSA Group.